Nationwide canal boat hire specialists. This very beautiful canal is one of the most popular Waterways in Europe, and includes the famous Pontcysyllte Aqueduct, which is one of the most spectacular and amazing feats of engineering on the Canal system. Built by Thomas Telford in 1805, the Aqueduct is 126 feet high, and spans over 1000 feet across a valley with the River Dee thundering away in the distance below your feet. The Chirk Aqueduct is another impressive structure built by Thomas Telford, and is 70 feet high, and beside it at 100 feet high is an impressive Viaduct built in 1848 to take the Shrewsbury & Chester Railway across the valley. The Chirk Tunnel is 1,377 feet in length, and once through this you can moor up and walk to Chirk Castle, a 700 year old Castle managed by the National trust. Cruising westwards towards Llangollen, on the first day you probably will not get very far, as by the time you've checked in and stashed all your belongings and provisions, watched the training video and had your training, time will be passing. If you fancy a bit of cruising before dark, you will just have time to get used to the feel of your boat, and enjoy the beautiful countryside, before you moor up after a few miles and make yourself a cup of tea and relax after the stress and strain of the days car journey. Cruising time to here 2 hours. Continue your cruise and you will shortly reach Whixall Moss, a raised bog with rare insect and plant life, but there might be mosquitoes as well! The bog was also formed during the Ice Age. There are walks & cycle routes over Whixall Moss, see leaflets near bridges 44 & 45. There is a lovely lift bridge at bridge 45. The canal branches away to your left but Prees Branch only leads to a nature reserve & a marina, so keep right. The canal passes into England and then into Wales, going backwards & forwards past a remote and unpopulated area. At bridge 48 is the small village of Bettisfield, there is a stores here & off-licence. Soon the open countryside gives way to more hilly wooded landscape as you start to pass through the Meres that make this area famously called the mini Lake District. Cole Mere is the first on your left, then Blake Mere further on your right. The largest Mere is by Ellesmere itself, you can walk to it from Bridge 57 just after the short Ellesmere Tunnel. The Meres were carved out during the Ice Age. You will soon be approaching Ellesmere, and a fine old warehouse and small canalside crane, and old canal company offices, testify to the canal trading that used to be carried out from here. Ellesmere is a busy 18th century market town with delightful pubs and restaurants, also a variety of shops and a Co-op. Moor up the end of the Ellesmere Arm a canal branch to your right if you would like to take a look. It is 3.5 cruising hours to here, so enough time for lunch and to get extra supplies. Back on the Llangollen canal, the countryside once again becomes rural and quiet, and the canal very winding. At Frankton Junction the Montgomery canal turns away to your left, it is navigable for about 4 hours cruising, just beyond Maesbury marsh. To enter the Montgomery canal there are 4 locks called the Frankton Locks, and these are only opened by a lock-keeper between 12-2pm (Please check hours when booking). 48 hours notice of passage is required. Only boats with a booking will be allowed through the locks. Please note that no passages will be allowed outside of the published hours. To book a passage call 01606-723800 during normal office hours from Monday to Friday. Continue on the Llangollen Canal through the green countryside passing Hindford Bridge, where there is a lovely Pub, The Jack Mytton Inn- right by the canal. Shortly after Bridge 11, you will come to your only locks on this part of the Canal. There are 2 locks quite close to each other. If a boat has just come through, past you, you are in luck, as the lock is with you, and you can open the gates and go straight in. Get your crew out just before the lock, and make sure they have the windlass to operate the lock gates, as you were shown in the training. After the 2nd lock on the right hand side, you can moor up and fill up with water if needed ( you will need the British waterways key that is on your bunch of keys). Water points are marked on your map along the canal. A bit further on, after Bridge 15, there are some very posh moorings outside the Lion Keys Pub & restaurant, just before you go under the A5 road. There are 20 moorings for customers and you can moor here overnight. It is 7.5 hours cruising to here from Platt Lane. You will start to see less cows & sheep & see more houses now, as you are approaching the town of Chirk. At Bridge 21 you can moor up and walk to the Bridge Inn, the last pub in England, before you cross the Chirk Aqueduct into Wales. Make sure there is no-one coming over the aqueduct. The Aqueduct is 70 feet high and was built between 1796 and 1801 by Thomas Telford & William Jessop, it is a practise run before you get to the Pontcysyllte Aqueduct, but it is very beautiful in itself, and crosses over the River Ceiriog. It is not as frightening as you would think, with spectacular views of the River cascading down the valley below, and the Chirk Viaduct above you. You cannot go very fast across the Aqueduct, so just enjoy the view, as very soon you come to the end, and the beginning of the Chirk Tunnel, which at over 400 metres is one of the longest tunnels on the waterways system to have a towpath running through it. After you have emerged from the tunnel you might want to moor up & take a look at Chirk, or get some supplies. If you want to first visit the fantastic medieval Chirk castle moor up just before Chirk Tunnel , walk along the road westwards (left) to the castle gates, it is about a 20 minute walk but well worth it. This magnificent 700 year old fortress was built by Edward the 1, and has family apartments, state rooms, servants quarters and dungeons which can be viewed. It is 2.5 cruising hours to here from the Jack Lytton Inn at Hindford. Do not be tempted to stay the night here, as Cadburys have a site near here hidden by the trees, as does a large sawmill, so you might not get any sleep as they seem to work all night!! 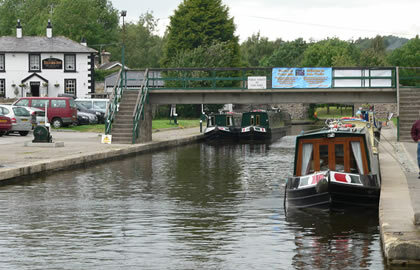 If you want to moor up off the canal you can do so at Chirk Marina, which is a bit further on, there is a Golf Club there, with a bar & restaurant which are open to the public, they charge about £7 for an overnight stay. Once the canal turns away from the railway you will find the Offas Dyke path following the Canal. There is a very quaint lift bridge to negotiate at Froncysylite, you will have to lift it up using your windlass key. If you want to build up your nerve before crossing the Pontcysyllte Aqueduct, you can stop at Froncysyllte there are 2 pubs, the Britannia Inn and the Aqueduct Inn. You might have to queue for the Aqueduct , you will need a runner to go ahead & see if any boats are coming over towards you, if not you can go for it. They sometimes have British waterways staff here who will try & organise who can go first!! The views are breathtaking, but so is the fact that you have nothing but fresh air for 130 feet below you on your left. There is a walkway on your right. The River Dee thunders away far beneath you. You immediately come into Trevor Wharf, where you can turn the boat and cross back over the aqueduct, or moor up as there is a pub – The Telford inn, next to the Anglo Welsh base. Cruise back to Hindford and spend the night here as it is 6 hours cruising. It is 7.75 hours back to Whitchurch marina. NB: This route has been provided as a guide only. Information may become inaccurate or out of date. 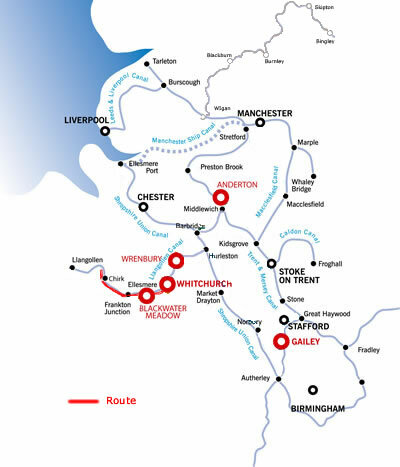 You should always check with the marina that the route is possible within your time frame, current weather conditions and canal stoppages etc. (Sleeps a maximum of 4 People). (Sleeps a maximum of 5 People). (Sleeps a maximum of 6 People). (Sleeps a maximum of 8 People). NB: Distances are as the crow flies and will vary for actual canal boating travel distance. The information above is provided in good faith to assist you with planning your canal boat holiday. Information accuracy cannot be guaranteed, however, if you do see something that needs updating, please don't hesitate to contact us. Canal Boat bookings made easy. PO Box 57, Budleigh Salterton. Devon. EX9 7ZN. England.